Kevin Roscoe first realized his talent for sculpting ice in 1979. He has owned Cascade Crystal Ice Sculptures Inc. in Seattle with his wife Stephanie since 1991 and has been a partner in Fear No Ice performance sculpting worldwide since 1996. Kevin always strives for perfection with his unique and captivating designs. As an innovative sculptor, Kevin has been featured on Good Morning America, The Charles Kuralt Show, Ordinary Extraordinary and the Food Network. He has also appeared on the Discovery Channel series Travelers and on Seattle’s local television networks. On a competitive note, Kevin has won numerous National, International and World Championships. He has represented the United States in 4 of the last 5 Winter Olympics cultural arts events. Kevin won the Bronze Medal at the 1994 Olympics in Lillihammar, Norway. In 1995 he won the World Championship in Linz, Austria, and also the U.S. National Championship. Kevin and his teammate Steve Brice captured the Gold Medal at the 1997 World Championships in Fairbanks, Alaska, and in doing so won the right to represent the United States in the 1998 Olympics in Nagano, Japan. In 2009 Kevin helped lead a team of sculptors in setting the Guinness Book of World Records for the tallest ice sculpture, at over 45 feet tall, in Santa Monica, California. As ice lounges have gained in popularity, Kevin has created permanent installations in Las Vegas and New Zealand and a temporary attraction in Vancouver, B.C., for the 2010 Winter Olympics. 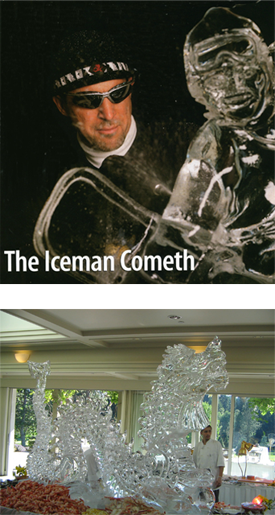 Over the past 37 years Kevin has enjoyed the opportunity to express his love of art through his magnificent ice sculptures.